Just give me a minute to put my face on. EX MACHINA. Maybe it's foreshadowing: The first half of 2015 has, so far, produced two mainstream cinematic explorations of artificial intelligence. It would hardly come as a surprise if Apple's next big launch is a sentient machine, which would simultaneously provide delicious vindication to all the sci-fi nerds and likely signal the onset of the global apocalypse. If and when that happens, the product will probably more closely resemble Ava (Alicia Vikander), the robot at the center of Ex Machina, writer Alex Garland's (The Beach, 28 Days Later) cool, stylish directorial debut, than Neill Blomkamp's lovably raggedy Chappie. Ava is the creation of a reclusive Internet billionaire genius named Nathan (Oscar Isaac), who seems to divide his time evenly between intensive R&D and getting blackout drunk, both within the confines of his remote, ultramodern estate. Caleb (Domhnall Gleeson), a programmer deep in the beehive of Nathan's company, wins what looks like a golden ticket: an opportunity to spend a week working and partying with the man himself. It almost seems too good to be true, especially when Nathan reveals that Caleb has been selected to rigorously test the intelligence of his latest project. As Caleb descends into the rabbit hole with both Nathan and Ava, though, questions of responsibility, control and manipulation abound. Caleb's retreat with the boss and the girl he built becomes far more involved than anyone could have anticipated. Garland examines the AI dilemma probingly, drawing in elements of creation myths from Christianity, Hinduism, Greek philosophy and early science fiction. The result is a measured, literary movie that, while obviously intelligent and finely crafted, somehow loses momentum when it needs it the most. The majority of Ex Machina builds effectively, the striking austerity of its setting, camera work and pacing all neatly synchronized. But when a little chaos is introduced, the movie struggles to overcome its admittedly elegant inertia. 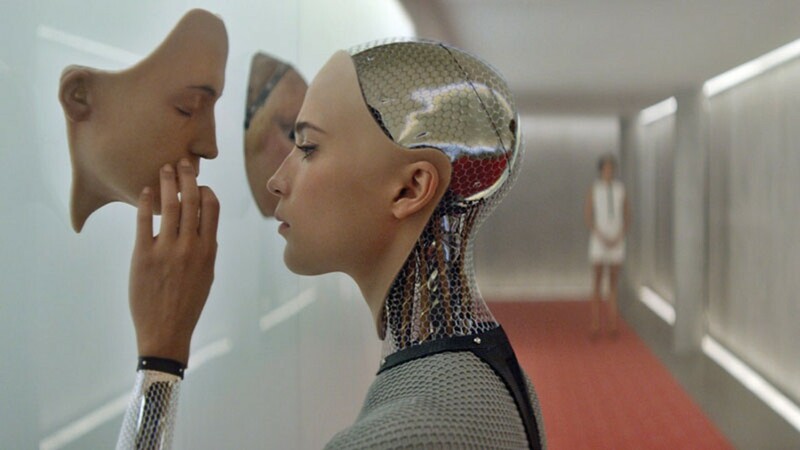 I hate to damn it with faint praise, because where Ex Machina succeeds, it does so resoundingly. The characters, all thoroughly imagined and vividly portrayed, keep secrets and harbor their own dubious motives. Style abounds in the production design, visual effects and cinematography. The cumulative effect is, right up until the end, convincingly enveloping. But when the climax arrives, it isn't surprising enough to disrupt the pleasant numbing effect of the preceding 90 minutes. My level of satisfaction with the ending notwithstanding, Ex Machina is compelling, original, exceptionally well-acted science fiction — an impressive achievement, if an imperfect one. R. 108m. THE AGE OF ADALINE. I was completely convinced, almost from the outset, that this was adapted from somebody's favorite book club selection. The wooden narration, arch historiography and mild magical realism feel like they were taken directly from the pages of some mediocre contemporary novel. Not so: It's just a painfully overwrought, falsely literary screenplay. The movie could be worse, though. Adaline Bowman (Blake Lively), a San Franciscan born just after the turn of the last century, lived a full life until she was in her late twenties. She married, had a daughter and lost her husband to accident in the construction of the Golden Gate Bridge. Then she was in a car accident in which she was struck by lightning and stopped aging. Fearing government vivisection, Adaline assumes a new manufactured identity every 10 years, never getting close to anyone except a series of cocker spaniels. But then she falls for wealthy philanthropist Eliis Jones (Michiel Huisman). When they visit his parents in Sonoma County for a long weekend, things get a little awkward: Turns out Adaline (now Jenny) and Ellis' dad (Harrison Ford) knew each other — wink — many years ago. Awkward! This leads to something of a crisis for Jenny/Adaline, which precipitates a rushed, predictable ending for the movie. Overall, The Age of Adaline is watchable enough. Director Lee Toland Krieger's (The Vicious Kind, Celeste & Jesse Forever) style suits the tone of the story, moving it along with a gentle, classic Hollywood pace. The performances are generally solid, although Huisman's Dutch accent occasionally pushes through and Lively delivers her lines like an audio double for Robin Wright's Claire Underwood on House of Cards. This is a harmless, likable date-night movie that, taken at face value, is perfectly pleasant. Closer scrutiny might reveal it to be self-important and histrionic, but maybe we should just leave well enough alone. PG13. 113m. AVENGERS: AGE OF ULTRON. The superheroes assemble again to battle a robot army and the evil baritone of Ultron. PG13. 141m. INDERELLA. Kenneth Branagh's adaptation makes an old story new with classic Hollywood style, solid lead Lily James and the wicked-chic Cate Blanchett. PG. 113m. LITTLE BOY. A boy who desperately want his father home from war discovers his own supernatural powers in this family fantasy with Emily Watson and Michael Rapaport. PG13. 100m. THE LONGEST RIDE. The latest Nicholas Sparks adaptation has young lovers reading old love letters, this time with a rodeo backdrop. Predictable and dull, it hits the dirt like a fallen rider but nobody cares if it gets up. PG13. 128m. WHILE WE'RE YOUNG. Noah Baumbach's writing and an excellent cast create real-life ambiguity in a story about married 40-somethings trying to keep their cool and men who act like boys. With Ben Stiller and Naomi Watts. R. 97m. WOMAN IN GOLD. Ryan Reynolds struggles to keep up with Helen Mirren, who plays a Holocaust survivor fighting to reclaim her family's art in this based-on-a-true-story Oscar-bait. PG13. 109m.